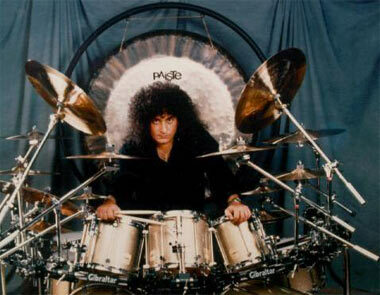 Bobby Rondinelli replaced Cozy Powell after the latter’s resignation was accepted in 1980. Rondinelli was actually invited to see the band play the last gig with Powell at the Monsters Of Rock show in Donington, 16 August 1980. He was told, however, to keep out of sight of Powell so as not to upset anything. Rondinelli recorded two albums and toured extensively with Rainbow but was replaced by Chuck Bürgi for the Bent Out Of Shape album. It is reported that he was sacked at Joe Lynn Turner’s request, but Turner denies this claiming Blackmore was the one to make the decisions over personnel. Rondinelli joined the Over The Rainbow ‘tribute’ during 2008 -2010, with Joe Lynn Turner and Jürgen Blackmore.